Chlorine dioxide (ClO2) is a yellow-green gas with an odor similar to chlorine but otherwise it is very different. It has been recognized as a disinfectant since the early 1900s and has been approved by the US EPA for many applications. It has been demonstrated effective as a broad spectrum, anti-inflammatory, bactericidal, fungicidal, and virucidal agent, as well as a deodorizer. Pure chlorine dioxide is an unstable gas and therefore is generated as needed. Although chlorine dioxide has "chlorine" in its name, its chemistry is radically different from that of chlorine. When reacting with other substances, it is weaker and more selective. For example, it does not react with ammonia or most organic compounds. Its chemistry is different from that of chlorine and hypochlorites, also. Chlorine dioxide oxygenates products rather than chlorinating them. Therefore, unlike chlorine, chlorine dioxide does not produce environmentally undesirable organic compounds containing chlorine. Chlorine dioxide (ClO2) acts as an oxidizing agent and reacts with several cellular constituents, including the cell membrane of microbes. By "stealing" electrons from them (oxidation), it breaks their molecular bonds, resulting in the death of the organism by the break up of the cell. Since chlorine dioxide alters the proteins involved in the structure of microorganisms, the enzymatic function is broken, causing very rapid bacterial kills. The oxidative attack on many proteins simultaneously is behind the potency of chlorine dioxide and explains why the cells of microorganisms are unable to mutate to a resistant form. In addition, because of the lower reactivity of chlorine dioxide, its antimicrobial action is retained longer in the presence of organic matter. The difference between sporal and bacterial inactivation can be likened to the difference between sterilization and disinfection. For example, for a chemical agent to be classified as a sterilant, it must be demonstrated to have sporicidal activity. For this reason, spores are commonly used as a challenge in sterilization process development. Disinfection, on the other hand, does not require the complete inactivation of microbial life and in some cases disinfectant claims may be substantiated by demonstrating bacterial inactivation capability. "Bacterial endospores are one of the most persistent forms of microbial life and typically require aggressive inactivation procedures. Vegetative bacteria are generally much more easily inactivated than are bacterial endospores. This is primarily because the sensitive areas of bacteria are easily contacted by chemosterilizing agents. The spore, however, has a more complex structure than the vegetative bacterial cell. Its sensitive material is contained within a core and that core is surrounded by a cortex and spore coats. These coats tend to act as a permeability barrier to the entry of chlorine dioxide and other compounds". Chlorine dioxide's special properties make it an ideal choice to meet the challenges of today's environmentally concerned world. Actually, chlorine dioxide is an environmentally preferred alternative to elemental chlorine. When chlorine reacts with organic matter, undesirable pollutants such as dioxins and bio-accumulative toxic substances are produced. Thus, the EPA supports the substitution of chlorine dioxide for chlorine because it greatly reduces the production of these pollutants. It is a perfect replacement for chlorine, providing all of chlorine's benefits without any of its weaknesses and detriments. Most importantly, chlorine dioxide does not chlorinate organic material, resulting in significant decreases in trihalomethanes (THMs), haloacetic acids (HAAs) and other chlorinated organic compounds. This is particularly important in the primary use for chlorine dioxide, which is water disinfection. Other properties of chlorine dioxide make it more effective than chlorine, requiring a lower dose and resulting in a lower environmental impact. Chlorine dioxide is widely used as an antimicrobial and as an oxidizing agent in drinking water, poultry process water, swimming pools, and mouthwash preparations. It is used to sanitize fruit and vegetables and also equipment for food and beverage processing. It is used to decontaminate animal facilities. It is also employed in the health care industries to decontaminate rooms, pass-throughs, isolators and also as a sterilant for product and component sterilization. What's more, as an oxidizing agent, it is extensively used to bleach, deodorize, and detoxify a wide variety of materials, including cellulose, paperpulp, flour, leather, fats and oils, and textiles. Approximately 4 to 5 million pounds are used daily. What about liquid? Will CD get into it? Will it kill organisms in it? What is the D-value? 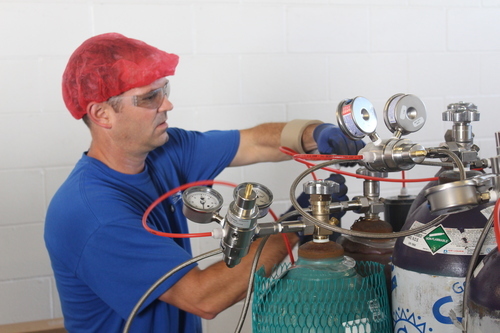 In order to maximize process reproducibility and minimize materials effects when using the chlorine dioxide gas it is best to avoid pools or puddles of liquid water. However, if small amounts of liquid are present the efficacy of chlorine dioxide is not affected. The reason that small amounts of water will not impact sterilization efficacy is that chlorine dioxide is readily soluble in water. The partition coefficient (CClO2(H2O)/CClO2(air)) of chlorine dioxide at 22 C and 101 kPa is about 38. And provided that the quantity of water is small the gas concentration in the water reaches equilibrium quickly. In any case, the final concentration of chlorine dioxide in the water will be higher than the concentration in the gaseous environment. Further the activity of chlorine dioxide in water is even greater than its activity in gaseous phase. Its bactericidal, virucidal and sporicidal properties in water have been demonstrated at minimum concentrations of 0.20-0.25 mg/L (aq) with temperature dependent D-values for common water contaminants in the range of 16 to 40 seconds at 30 to 20 C. For gaseous applications, Dvalues at 20 C for common indicator organisms are 14-45 seconds at 20-10 mg/L (gas).